When working on my post about responsibility for sidewalks, I realized I did not have a good illustrating photo for the post, so I went off walking in my neighborhood (midtown) looking for examples of broken sidewalks. After walking a couple of miles, I’d found only a few, and they were not bad. I guess my view of the world has been jaundiced by the time I spend in the suburbs, where many of the sidewalks are broken and deteriorating. There, it would take me less than a block in most areas to find something wrong with the sidewalk, or to find no sidewalk at all. In midtown, that is not so. I see a lot of places where the sidewalk has been replaced or repaired, often many times over the years, in a patchwork of concrete of varying ages. There are asphalt patches over uneven sections, which work as long as they are kept up to date, but must eventually be repaired by removal and replacement. The worst places I saw were associated with driveways and alleyways. 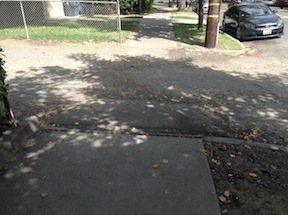 On some alleys, the asphalt extends to the street rather than the concrete sidewalk extending over the alleyway, and in this case it may be cracked, broken, or too steep for wheelchair use. 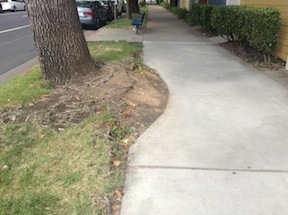 Other areas of poor sidewalks occurred adjacent to abandoned or undeveloped property, with more deterioration and more likelihood of vegetation crowding the sidewalk. Jim Brown pointed me to two areas with poor sidewalks, on S Street and 21st Street, but even they were not that bad, with some root heaving and uneven surfaces, but still passable. So, let me state that the sidewalks in midtown are in good shape. Not perfect, but pretty darn good. I feel more lucky than ever to live in midtown. I’ve separated out my Sacramento sidewalk photos (Flickr) from my Sacramento transportation photos in order to provide more focus on sidewalks, crosswalk, and paths. Next Post whose responsibility are sidewalks?